In January, the much-loved brutalist staple of London’s art scene, the Hayward Gallery, reopened after being closed for two years. Long-planned, the closure took place in order for the shuttered concrete galleries to get a much-needed renovation, with an upgrading of infrastructure and renewed building services. More critically, there was a low-intervention, high-impact transformation in the upper galleries, overseen by Feilden Clegg Bradley Studios (FCBS). Taking pride of place in these newly bright and spacious galleries are monumental, large-scale images from German photographer Andreas Gursky (born 1955), whose retrospective has reopened the Hayward with a bang. As many will know, the Hayward is marked by a crown of 66 pyramid-like skylights. Part of the gallery’s original design by LCC architects Norman Engleback, Ron Herron and Dennis Crompton, their internal effect was blocked by the early construction of a dropped false ceiling, which remained there for decades. Under the Southbank Centre’s direction, FCBS removed this ceiling in the upper galleries and restored the original tall spaces flooded with natural light from the skylights, which from below appear as square windows at the end of new deep acoustic coffers. Adjustable, subtle, skylight blinds allow for the complete control of natural daylight in the space. Speaking at the reopening, gallery director Ralph Rugoff described how it felt like ‘the genius of the building can fully be seen for the first time’. A genius, one senses, he feels well articulated by the presence of Gursky’s work. Gursky’s images are addictive, at times hypnotic — visually satisfying and fascinating to study, they have great popular appeal. What’s more, large-scale photographs are relatively easy to curate; as such, I can’t help but feel the Gursky show is somewhat of an easy win for the Hayward — but that doesn’t mean it’s not an excellent exhibition. In a culture where most images are viewed on our smartphone screens, it is an important opportunity to experience photographs as intended by the artist: in this case, in large-scale, high-impact, high-detail presence. The show is broadly laid out chronologically, allowing us to go on the journey of Gursky’s artistic — and technical — evolution. While the subject matter of Gursky’s images shifts, and his technique varies in the level of digital manipulation he embraces, the photographs have an aesthetic common thread in that they are mostly distant perspective studies of an environment — natural, built, human or otherwise — and explore ideas about scale, perception and pattern. At the start of the show, covering his early years of photography, it is the relationship of people to landscapes that fascinates Gursky. Whether crossing a mountain range in a cable car (Dolomites Cable Car, 1987), bobbing over choppy waters towards a powerful waterfall (Niagara Falls, 1989) or ascending a sunny mountain (Klausen Pass, 1984), the humans in Gursky’s photographs are seen as small fragments of a much larger, more powerful — even overwhelming — setting; one that begins to evoke in the viewer a sense of the sublime, as we observe the grand beauty of these landscapes alongside the relative human insignificance, even vulnerability, within them. At the same time, the images trigger a slight sense of disorientation through their visualisation of extreme polarities of scale (1.5m-tall human vs 1,950m-tall mountain, for instance) — and this play of scale, this disorientating effect, is something that continues throughout Gursky’s work over the decades. It is tempting to think that Gursky approaches his images as almost mathematical constructions. Of Klausen Pass he commented that what drew him to the picture was the realisation that the people climbing the mountain appeared in ‘a perfect constellation’. This keen fascination — or obsession — with pattern, and repeated elements relating to one another, would grow to dominate his work. The artist himself saw Salerno I (1990), a large-scale photograph of a busy harbour in the Italian port town, as a turning point in his career. The image’s planes flattened as if all elements are to the fore, the highly detailed scene depicts what Gursky terms ‘aggregate states’, in which multiple individual elements, of equal importance, make up a whole. From here on, Gursky looked to capture the patterns in urban, human, built, and natural landscapes. In the same way that Gursky almost dehumanised the bodies in his early natural landscape images — turning them into strategic pictorial elements or reminders of scale — later photographs such as May Day IV (2000), The Chicago Board of Trade III (2009) do the same through pattern, transforming human crowds into tools of abstraction. Whether intentionally or not, they’re also highly reminiscent of Where’s Wally pictures: crowded with detail and repeated elements, taking the eye on a journey of analysis and exploration. His obsession with pattern may reflect his own admission that he is preoccupied with the ‘way that the world is constituted’. Order, even within apparent disorder, seems to be the magnetic force that attracts his lens. Only it is not as simple as just point and shoot for Gursky; as he moved into the Nineties, the artist began using processes of digital post-production to best achieve the image he wanted to create, whether that meant artificially applying uniform focus or stitching together multiple images into one. Reality, artifice and vision have a complicated interconnected relationship in Gursky’s work; for him, a better, or ‘truer’, image of something is not necessarily one that is most accurately captured. In Tokyo (2017), a seemingly simple snapshot of the cityscape is in fact constructed from details of dozens of individual shots of urban neighbourhoods taken from the window of a high-speed train. In this way, Gursky is trying to convey a view, an impression, that goes beyond one split second, and actually weaves together multiple realities into one, more powerful, whole. It nevertheless raises the question: what is an authentic image? At times Gursky achieves what he sees as truth — or ‘the essence of reality’ — through fiction. ‘Reality can only be shown by constructing it,’ he once said. Of course, Gursky’s work is not simply all about visual effect: through the subjects he photographs, the artist explores the social, environmental and cultural issues of our time, from mass consumption to the evolution of technology. In Nha Trang (2004), we see dozens of women in a Vietnamese factory making furniture for Ikea; in Amazon (2016), a vast warehouse is photographed containing what appears like a sea of packages ready to be delivered to the thousands of e-shoppers who bought them. 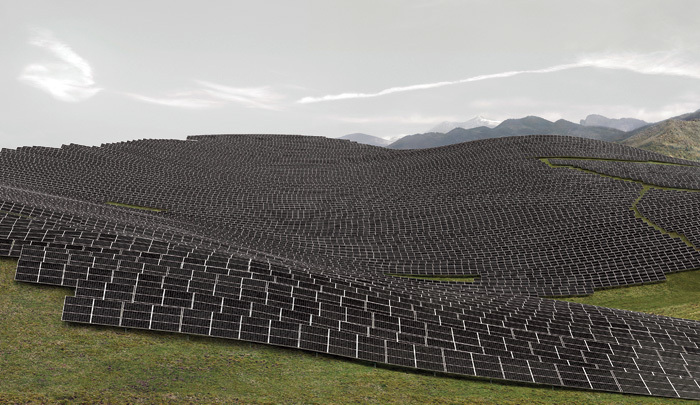 Meanwhile, in the outside and equally problematic world, Ohne Titel XIII (2002) depicts a landscape of pure rubbish — the large-scale rubbish dump in Chimalhuacán, Mexico City — while in Les Mées (2016), a skin of solar panels rolls over hills at a photovoltaic power station outside Marseille, France. Gursky captures place, space and the people within them in ways that tell a story: of human existence, of the bizarre wonder and ordered chaos of our natural and constructed environments, but ultimately of how the artist himself sees the world. His hyperdetailed, immersive images, arrest the viewer and demand consideration. 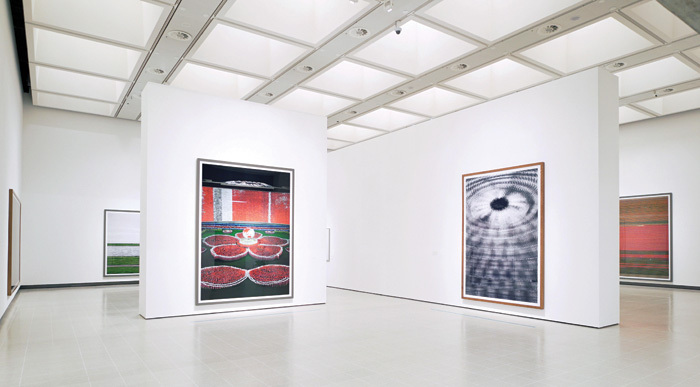 Gursky’s works are at once powerful and straightforward, working well with the Hayward Gallery space itself. ‘I like the brutalist architecture so much that I didn’t want to interfere with it too much,’ Andreas commented at the opening, thanking us for our ‘interest’ in his work, as if he weren’t one of the most successful photographers on the planet.